Nibbles, bits, bites and morsels, in short finger food are an essential part of every party. In fact they kick start an awesome party. 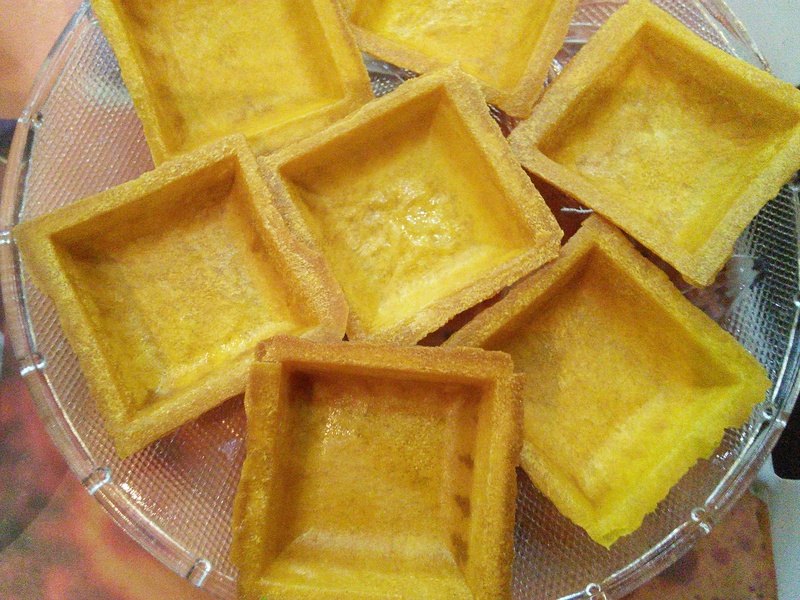 They are the Hors d’oeuvre, the first course of food items served before the main meal. And since that is the first item presented to the guests, every party host or hostess makes that extra effort to put the best foot food forward. Canapes are an ideal finger food. If presented well they can be the talk of the party. Either you can slog for hours rolling, baking, cooking these naughty little ice breakers or try something simple yet tasty and stylish. I have experimented with this sweet and savory Indian filling which is sure to tantalize your taste buds and leave you wanting for more. 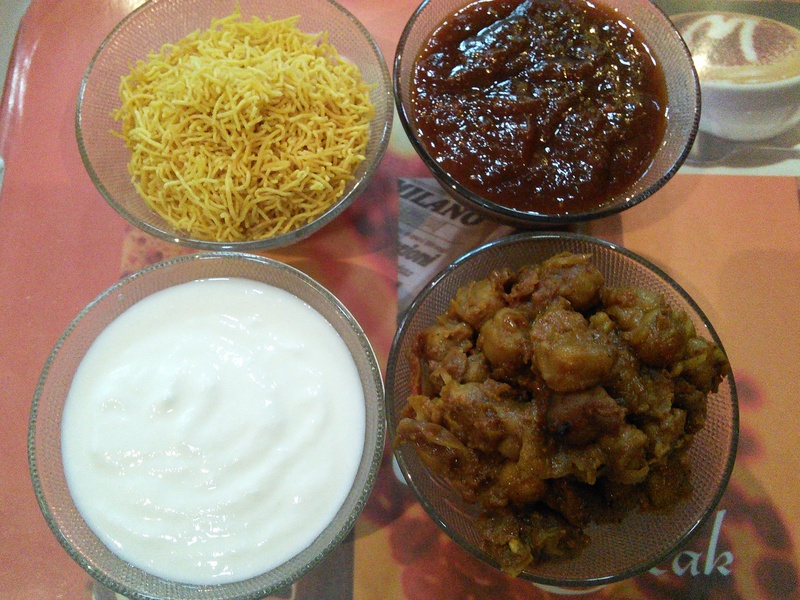 The best part is you can prepare every thing a day in advance and spoon it in when the guests have started coming in. 2 cans ( 15 ounce) Garbanzo beans drained. In a deep bottomed pan put some oil and fry 2 chopped onions till pink. Add 1 diced tomato and saute further. Add seasonings of your choice. For the Indian version I added salt, red chilli powder, turmeric powder and Punjabi chole masala ( easily available in Indian stores). Simmer for five minutes on low heat. Take off heat and keep aside. Soak a cup of jaggery in a cup of water. Take 3/4 cup tamarind extract/pulp. Boil them together in a pan till a beautiful glaze appears. Add half a teaspoon of rock salt, 1 tsp. chilli powder and 1 tsp. cumin powder. Take off heat and cool in the refrigerator. In case you cannot get hold of jaggery, use fresh pitted dates. If you can’t get rock salt/black salt use regular salt. Add some caster sugar to Greek yogurt. Sev is easily available in Indian food stores. It is used here as a sprinkle to add a crunchy and savory taste to the dish. I got these at a store. I just had to drop them in hot oil for a few seconds to make them crispier and tastier. Put a spoon of Garbanzo beans in the canape shell. Top it with some sweet chutney. Spoon some sweet yogurt on it. 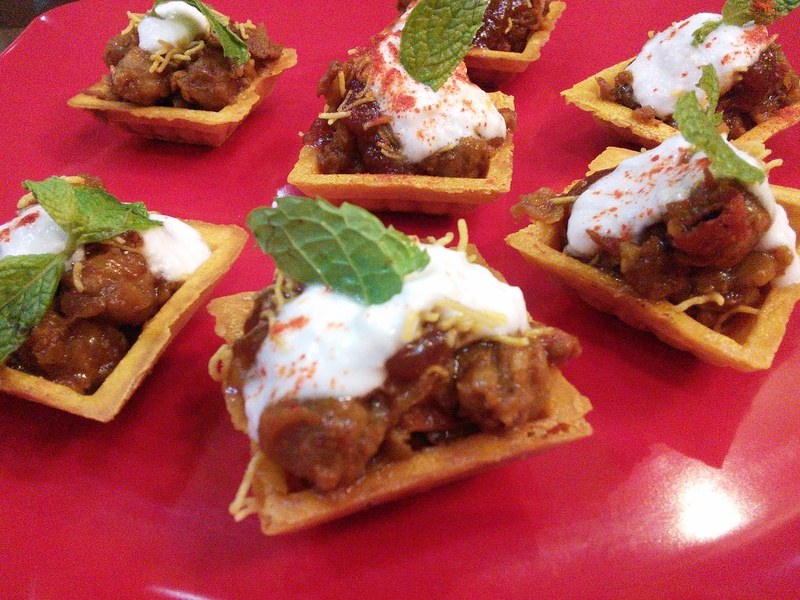 Now carry this tangy, delish finger food to the party and get ready to take the compliments. FF 25 is being co hosted by Hilda @Along The Grapevine and Julianna @Foodie On Board who have beautiful blogs worth visiting again and again. Let’s party.Come along with me…….. 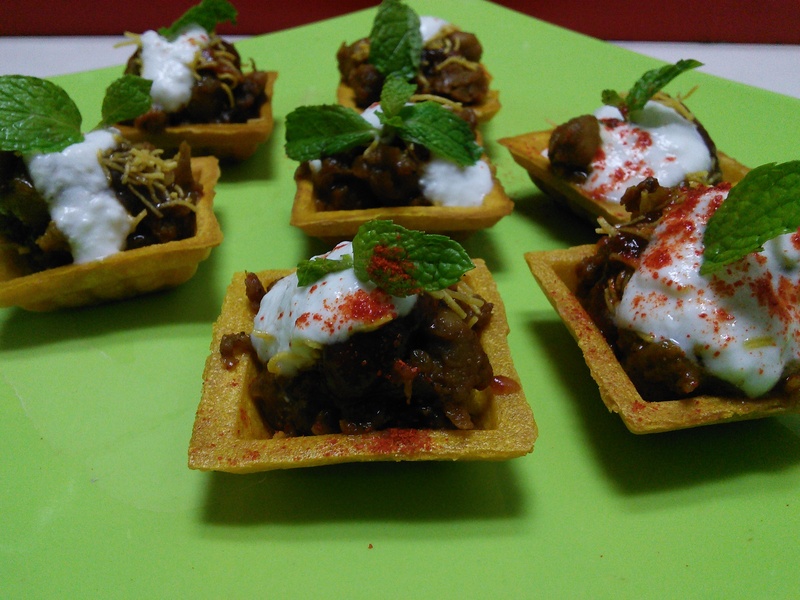 These canapés are so cute…just today I tried similar kind of chaat but your version looks fab SKD….. 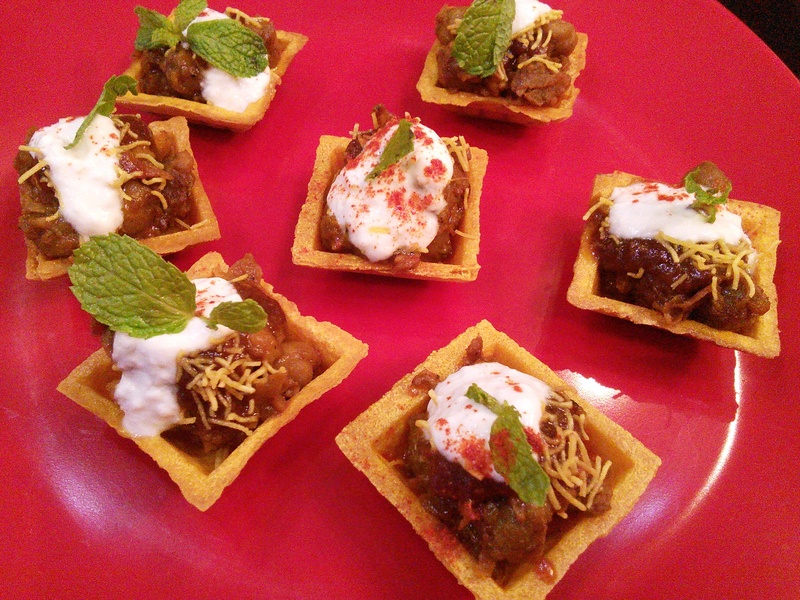 The hors d’oeuvre are my favourite course at any occasion but can be painstaking to make. These look pretty easy and delicious. I bet they would go very well with beer. Thanks for bringing them along to Fiesta Friday to sample. Wow!! This is so amazing.. Loved it!! Hmmm… what you told was right!! How fun it would be😃, if we were neighbours…!! Love these, they look and sound delicious. Great for a party! Love these!! Gorgeous! And so many options! Those look so cute! I’m visualizing them at someone’s dinner party. Cool. Thank you dear ☺ You will love them. I wonder where I can order the Canapes. Maybe online? Also thank you for your like on my post! Welcome ☺I am sure you can easily get them at any grocery store. fabulous and mouth watering, thanks for the recipe.